Digital Science Online is an annual subscription to a comprehensive collection of visual teaching tools. Teachers and students can access Visual Learning Systems' vast science media library of videos, clips, animations, images, and activities. Grade-specific visual elements make learning science meaningful, engaging, and long-lasting. 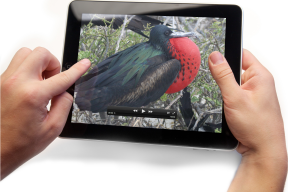 Videos and clips bring excitement and meaning to the science classroom. Vivid 3-D animations make hard-to-teach concepts easily understandable. Hundreds of annotated images add visual significance to lectures and at-home learning. Complete data-bank of assessments, hands-on activities, vocabulary exercises, and reading activities reinforce visual learning. 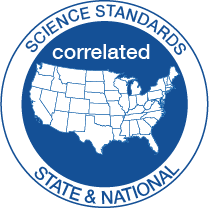 all media is correlated to state and national learning standards, common core and national guidelines. IP and referral authentication allows smooth integration with all networks. No servers or special software needed. Runs on all computers and web devices including SMARTBoards and iPads. Home schoolers and small learning communities can subscribe for a discounted rate. compare How is digital science online different than visual learning bundles or DVDs? 1 year subscription per school building. 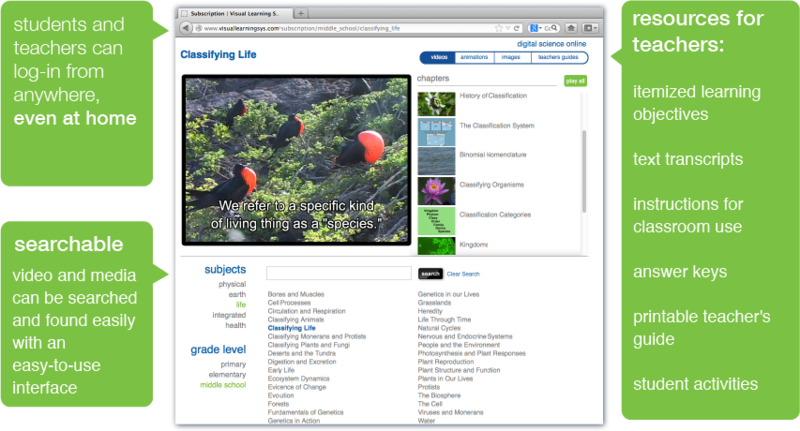 Visual Learning Systems produces science DVDs, Digital Media, and Teacher's Guides to support elementary, middle, high school, and introductory college curriculum. Our mission is to provide teachers with engaging visual media and instructional materials to help students achieve a high level of success in the science classroom.